"Affinity Classics is the class act in high quality chairs of distinction. ...valuable mementos that our family will appreciate for generations." • Universities Award Our College Chairs to Board Members, Trustees, Faculty, and Donors. • Businesses Award Special Chairs to Recognize Retirees, High-achievers, and Special Clients. • Alumni of Colleges, Universities, and Schools, Demonstrate Pride in Your Alma Mater with our chairs. • Interior Designers Offer Custom Furniture with Unique Looks to Match Nearly Any Creative Environment. • Professional Practices can Display Chairs that Reflect Each Professional's Education, Training, and Experience. • Not-For-Profit Organizations use custom chairs, Full-size or Miniature, to Honor their Principal Donors and Volunteers. • Hospitals, Medical Centers, and Medical Schools use college chairs to help Thank Donors, Residents, and Board Members. • Architects & Facilities Managers can Order Custom Chairs with Precise, Official Logos for Campus Buildings, Libraries, and Offices. • Perfectionists will Enjoy the Most Comfortable, Elegant, Colorful, Well-Constructed, Longlasting, College Chairs Available on the Market. Read Testimonials. See What Our Clients Say! your chair is by far the best college chair − both wood, logo...and the most comfortable." Affinity Classics builds comfortable, college chairs for college alumni and members of other affinity groups, with colorful logos. In a world of factory-made furniture and machine-made chairs, you are still able to find College Chairs of High Quality. Our University Chairs are made by Our Amish Craftsmen in Ohio and Our Traditional Craftsmen in North Carolina. 100% Made in America. ...and, unlike other companies, we build multiple styles of chairs. Our products include College Chairs Made in the US, all of which signify each owner’s pride of membership in their respective affinity group. Our styles range from Traditional English, Windsor style and Hitchcock style to the modern, Classic College Chairs of today. Each chair includes one logo installation; multiple logos are optional. Therefore, we ask you to speak with us on the telephone about your college chairs and university chairs, institution that the chair represents, chair’s availability, personalization, and shipping options. College Chairs Have Many Names. What Are College Chairs, Exactly? Our College Chairs are elegant, well-made hardwood chairs that display meaningful images (logos) that remind us of important our relationships, friendships, and affinities pertaining to colleges, universities, medical centers, businesses, and other organizations private and not-for-profit. 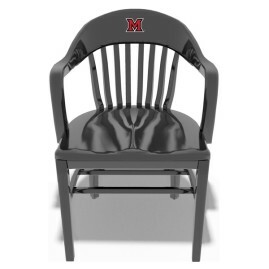 College Chairs are also known as Recognition Chairs, University Chairs, Alumni Chairs, Retirement Chairs, Graduation Chairs, Logo Chairs, Varsity Chairs, Engraved Chairs, Personalized Chairs, Hardwood Chairs, Hardwood College Chairs, Modern College Chairs, Captains Chairs, Alumni Classics, Commemorative Chairs, and Classic College Chairs. Clients purchase College Chairs for several reasons: unique graduation gifts, Christmas gifts, and birthday gifts, professional offices, honoring donors to not-for-profit organizations, and retirement gifts. Some folks love our chairs without any logos installed. They just like the way our chairs look and feel. Great design, wood, logos, construction, finish, fabric, craftsmanship, expertise, attention to details, and a passion for the business make The Best College Chairs!